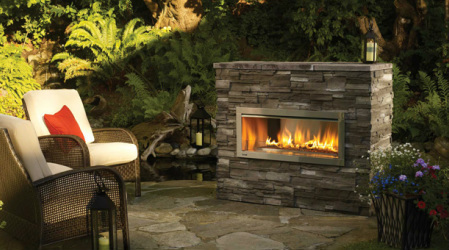 The Regency Outdoor Gas Fireplace collection offers a sleek, artistic styling to complement today’s modern outdoor living spaces. Whether you are looking for a tranquil retreat or a lively background to entertain, the versatility of a Regency outdoor fireplace, firepit or firetable creates an endless number of possibilities for your outdoor oasis. For custom designs, the Regency Plateau™ outdoor gas burner brings you the design versatility of a linear stainless steel burner for multiple applications. Available in 30" (PTO30) or install two together to make a 60" burner (PTO60). Regency’s versatile firetables are perfect for outdoor entertaining. Available with a Stainless Steel or Sunset Bronze UV rated powder coated top, you can further customize the fire table with the choice of multiple firebed options.